And then there was one. 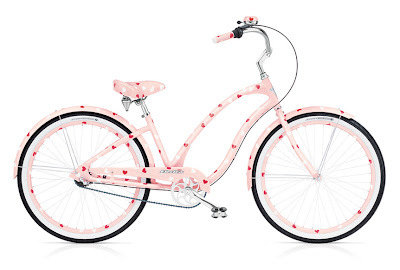 We were contacted this week by Jan, a Califorinia woman who had her heart set on buying an Electra Pink Sweetheart Pajama Party cruiser bike. When her local bike dealer and the west coast Electra rep told her they were out of stock and it was discontinued, Jan's love for the bike stubbornly persisted, inspiring a search on the Internet that led her to the Century Cycles website. Turns out, we are in possession of possibly the last two Pink Sweethearts in the U.S. Now one is boxed up and on its way to Jan, which leaves just one Pink Sweetheart in Rocky River, awaiting the embrace of an owner as passionate as Jan. She thanked us for our cross-country help and excellent website, but we send our appreciation right back at her -- Jan is another customer who personifies our slogan, "Define your life. Ride a bike."